Last summer I went to a party where they served frozen rosé wine slushies by the pool. I remember that I really loved the concept, but was left less-than-impressed with the execution; they tasted more like ice than anything else. As I usually do in these cases, I got home and promptly tried out my own version of the frozen drink with raspberries and a touch of honey. 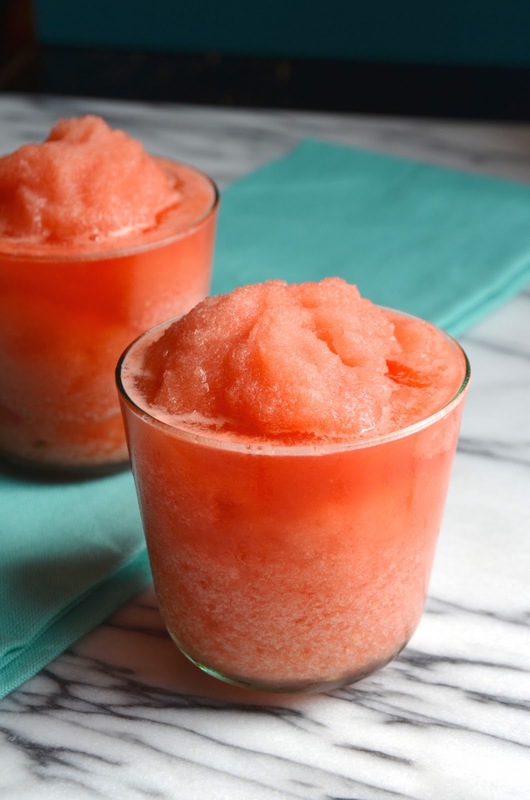 The result--these Raspberry Rosé Wine Slushies--was a hit and became one of my favorite recipes that year. Then a couple months ago, I suddenly started seeing everyone talking about something called "Frosé." That same slushy idea, but with a much cooler name. I'm kicking myself for not having come up with that, but will happily ride along on this trendy wave if it means I get to slurp down chilly glasses of boozy slush. Here's my newest version of the drink, made with chunks of frozen watermelon, rosé, and a touch of Campari for the grown-up summer edge. 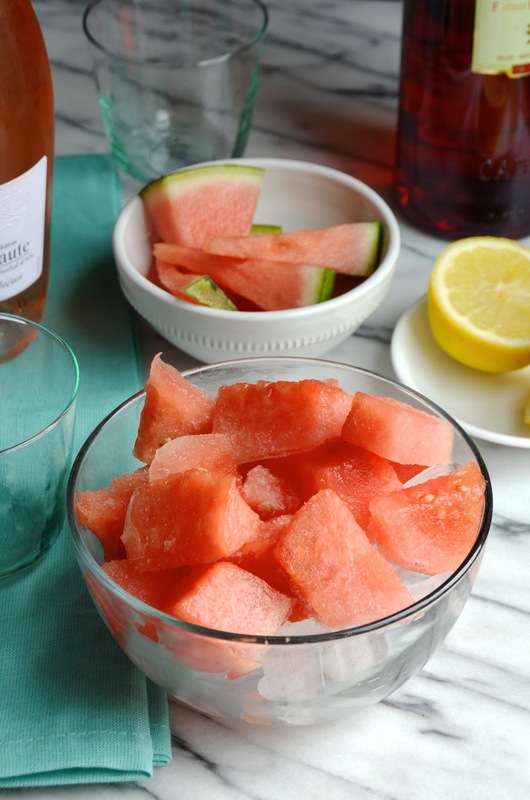 It's light, refreshing, and just the right amount of sweet. 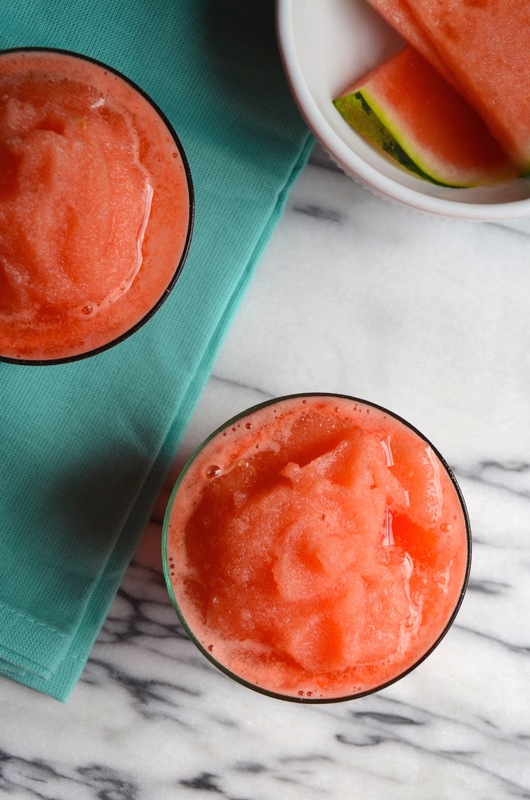 Serve up this slushy in short glasses straight out of the blender. They don't last long in the summer heat, but no worries... The perfect excuse to make a second batch! Combine all ingredients in a blender and puree until smooth and slushy. Divide into glasses and serve immediately.